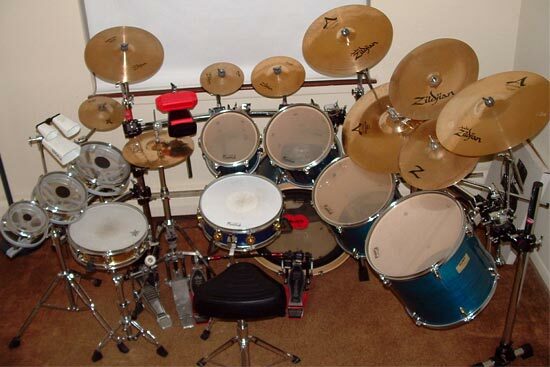 Having tried to find pictures of drum kits online for these past few months, it made me think maybe I should put a picture of MY kit on the web somewhere, somehow... Then I came across your site, what an opportunity ! And as this pic is a couple of years old, I now have an 8 tom and a DW cable hi-hat in place of the hi-hat stand shown, and incorporated a Roland SPD6 drum machine in place of the percussion on the left. I've been playing for about 17 years now, everything from thrash, metal, rock, jazz, big band, funk. Thanks again for the opportunity to show my kit off !